Apple's head of legal has denied all rumors about providing its complete source code or any backdoor to the Chinese government. Apple officially confirmed that the Chinese government has asked Apple twice in the past two years to hand over the source code for its operating system, but the company refused in both the cases. In a Tuesday hearing entitled "Deciphering the Debate Over Encryption: Industry and Law Enforcement Perspectives," the police officials put allegations on Apple for handing over user data to Beijing while refusing the authorities at its home in the US. However, speaking under oath at the congressional hearing, Apple's General Counsel Bruce Sewell denied the claims, saying "We have been asked by the Chinese government" for the source code behind the iPhone. But, "we refused." The response came just after Indiana State Police Captain Charles Cohen accused Apple of providing its source code to China. Neither Captain Cohen presented any evidence of his allegation, nor he claimed to know whether this was accurate. Instead, he cited media reports to prove his point. "I saw several news stories that said Apple provided the source code for the iOS [operating system for iPhone and iPads] to China," Cohen said without pinpointing the publications. The allegations on Apple have continued due to the company's refusal to help the Federal Bureau of Investigation (FBI) gain access to the iPhone used by the San Bernardino shooter Syed Farook. The law enforcement officials have started accusing Apple of handing over its users information to the Chinese government for business purpose while refusing to cooperate with U.S. authorities for access to private data in criminal and terror investigation. 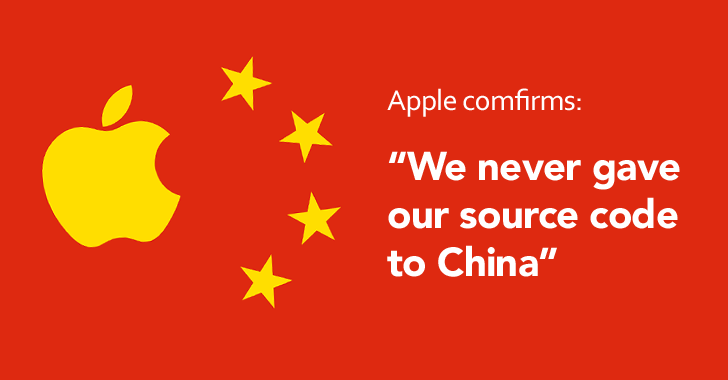 However, Apple's Swell apparently said: "We have not provided source code to the Chinese government. We did not have a key 19 months ago that we threw away. Those allegations are without merit." On one hand where authorities want Apple to provide them access to valuable data in serious crimes, like terror, deaths, and rapes. On the contrary, technical experts argue that if the company creates a hole in its security, it will open all its customers to not just the government but also the potential hackers. However, when it comes to complying with government request in serious crimes, Apple has provided data in 80 percent of cases originating from law enforcement in North America and 66 percent from China. It was previously reported that in the wake of its legal battle with the US Department of Justice, Apple was working on encrypting iCloud backups that only the account owner would have access. However, Mr. Sewell denied the reports, saying the company had made no such announcements about iCloud encryption plans. Moreover, such moves would further frustrate law enforcement agencies, who now can obtain iCloud data with a court warrant.